This Patrick’s Day, why not go ‘green fingers’ and give a Concern gift of a Vegetable pack? You’ll be helping some of the poorest and most vulnerable families grow nutritious food and keep healthy. They could also earn an income selling their vegetables at market too. For just £33, you could provide a family with a variety of seeds and tools they need to grow their own delicious vegetables. 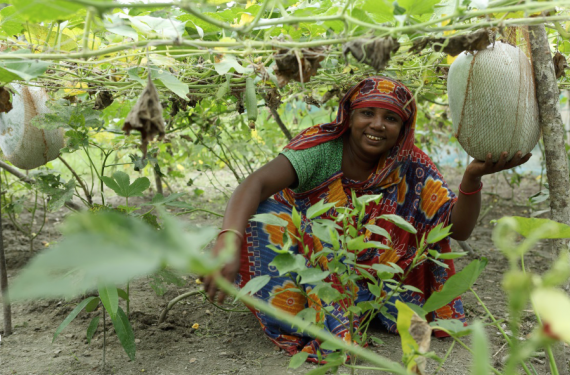 Anowara, pictured here, is now growing white gourd and other vegetables thanks to the help of Concern supporters. She not only puts healthy food in her children’s bellies, but with the income she makes selling her produce she can pay for their school uniforms too. That’s the difference veggies can make! Your gift of a vegetable pack will come with a personalized e-card to show your family and friends the amazing way you’re celebrating St Patrick’s Day. Not too keen on green veggies? Browse all Concern Gifts to find your perfect gift.